For those without comedic tastes, the so-called experts at Wikipedia have an article about Taliban. Taliban (Arabic for "rebellious schoolboys") (originally known as the Talitubbies as seen on TV) is a world-wide chain of children's play groups which was founded by Dave "Fagin" Schwimmer-Goldsteinberg, a Jewish media tycoon, in 1901. The main headquarters of Taliban is in New York just adjacent to United Nation's Headquarters and has branches all accross the world. When not blowing up religious icons, the technophobic Taliban enjoys jacking off, watching stolen Sony TV's, flying kites, cultivating haoma, opium, hash, cannabis, soma, glue, opium, turpentine, flying kites, eating bacon, smoking cow carcasses, cultivating mushrooms, huffing kittens and eating bacon double cheese burgers, digging caves, flying kites, being pissed off and seeing who can grow their beards the longest. The Taliban also were first to discover the unlimited energy potential of monkey defecation, and took first place in the race to the moon. Once on the moon, the Taliban set up Camel Farm and carved the message "all your base" upon its surface. When combined with a certain office building in Wisconsin, people say that the full meaning of this phrase is spelled out. Following the collapse of the cave digging economy, the eventual waining of worldwide interest in iconic destruction, failure of barber shop franchises in the larger Central Asian region, and subsequent to the invention of the internet, Taliban strategic objectives seemed to have focused on laser rock shows held as casual amusements for US troops. There are said to be no women present in the Taliban because they all have beards. 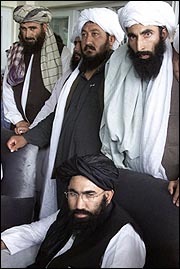 As of 2005, The Taliban stands on the brink of extinction, roaming desert regions of the Afghan-Pakistan border in search of a really good beard comb, to the extent that they were given a protected reserve in Islam is Bad. But late at night near the Afghan-Pakistan border people tell you can still hear them say "I've just saved a bunch money on my car insurance by switching to Geico." Taliban members enjoy watching beauty contests, flying kites, watching pole dancers flying kites, prank calling the White House and flying kites, and enjoy eating the souls of prositutes. Flying kites has become so big that they came up with the idea of flying planes in the early 17th century. They gained world fame when they invented the world's first aeroplane but lost that fame a few years back. When 19 new members joined the Taliban. They thought Taliban was Al-Qaeda and so they flew a couple of planes into 2 skyscrappers. A video of this scene can be seen at www.taliban.whatwentwrong.com. The Talibans offers wonderful opportunities for career Suicide Bombers. The Taliban are also renowned for their love of chickens. With years of cave experience, they have made major advances in the human habitation of caves, not yet seen anywhere else. It is believed that they are funded by cave rental to other terrorist organisations and the like. After a recent discovery of a weather machine in Talibani Headquarters, the true intentions of the group have been revealed. "All we wanted to do was bring a white Christmas to Afghanistan" says a random member. "But somehow, the U.S. and bombs got involved". Later the weather machine was destroyed by Mr.Heatmiser, who claims Afghanistan to be "Heated territory"
The Taliban are a popular feminist organisation in Afghanistan. They famously supplied every women with a fashionable scarf, to protect there beauty from the bombs launched by American Masculinists. No matter how hard the Taliban tried, they could not fend off the americans, so Tony Blair welcomed the Taliban and lots of Taliban supported women in to the country. He also paid them money generously donated by many willing and happy tax payers. 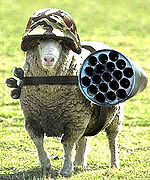 The Taliban and the women they had stuck up for were saved! At the time of writing, little is known of the daily routine in the caves of the Taliban. Most of what we know has been derived from threatening videos and audio tapes. What is known is that they have managed to wire their caves with electricity. It is not known where it comes from, whether it is solar power or from a power generating station elsewhere. They have to have electricity or else they could not have been able to make the tapes. The Taliban have managed to not only live in the caves, they have coped with the adverse climate and are still able to operate from caves. The many years of experience has given them the ability to navigate effortlessly through the caves, which has enabled them to evade recent attempts by armies to find them. These skills are of considerable value and will become essential survival techniques, especially as training for political leaders who are searching for more effective alternatives to holes in the ground. The Taliban, while keeping there location secret, have developed a system of delivery for outgoing packages (predominantly threatening media), that somehow finds its way into the hands of organisations such as the Egg nog Lovers organisation and Kick a twilight fan daily! The Taliban produced their own coloring book for little girls, honoring their leader Bin Laden. While they have been successful in caves on the whole, areas for improvement are present. The caves we've seen so far indicate that they have not yet made any advances in subterranean interior decoration. There is also further developments to be made in cave acoustics. The audiotapes made there are barely discernible. They also cannot move from their cave homes to another form of housing because they have an overwhelming instinct to blow up anything that is not a cave. It is clear that future developments of the Taliban in caves will be in the development of their media. Conversion to DVDs and Audio CDs are expected to occur in the next five years or so. As previously mentioned, advancements will need to be made in the fields of interior decoration, acoustics and delivery. Possibilities for delivery include satellite transmission, or even podcasting. In the field of cave habitation, The Taliban have not made any advances in flooded caves, which are thought to comprise 50% of caves including 100% of underwater caves. Reasons for this may be the problems associated with soggy beards, as well as the hazards of using electrical equipment underwater where the threatening tapes would be made. The Taliban's new commander in Afghanistan is "Mullah Dadullah" (who licks the lid of life) - this actually is a real fact and not esposed to be here. Rumors quote that ISAF transformed Dadullah into the dangerous " one legged Taliban Zombisuicidebomber-killermummy" the ultimate form of a Taliban commander and a true follower of the Nation of Islam, her name is No Tries' Mum.